KARACHI: Six days after Pakistan became an independent country, a teenager stood on a dusty street of Karachi with a begging bowl. He wanted to buy medicines for the migrants from India. That young boy grew up to become Abdul Sattar Edhi, Pakistan’s pride, the revered philanthropist who gradually became the heart, soul and brain behind the Edhi Foundation. “At the camps where the migrants had arrived, people were dying of diseases. There were dead bodies lying on the streets. I had to do something, so I buried the bodies, asked people for money and bought medicines for the sick,” says a frail-looking Edhi, at his office at old Karachi’s Mithadar. He sits on a sofa at the sparsely-furnished head office, meeting visitors and random strangers who enter to pay him respect. The Edhi offices are spread over a number of apartment buildings at the crowded Mithadar, where cars, vendors, people and stray dogs fight for space. In the late 1960s, Edhi began welfare work at a small shop at Mithadar. As his charity spread, he established an orphanage, ambulance centre, kitchens, and a medical dispensary in the same area. To this day, the 90-year old Edhi, with a failing kidney and fading memory, occupies a single room at the head office as his resting space. For people who grew up in Karachi, Edhi’s slightly eccentric ways of raising funds for the needy are nothing new. Be it collecting relief for earthquake victims or ransom for sailors kidnapped by Somali pirates — Edhi would stand on the street with a begging bowl, and passersby would stop, shake hands with him and contribute money. Did he ever feel awkward begging on the streets? “What is wrong in asking people for help?” he says. In the restive port city, as Lyari gangs picket and Mohajir and Pathan fight turf wars, Edhi ambulances quietly make their presence felt, picking bodies, rescuing people regardless of which side of the law they are on — police and criminals both co-operating with the Edhi drivers. Faisal claims Edhi’s passion is the sole driving force for the over 3000 employees who work at the foundation with wages much lower than the market rate. “We married for love,” says Edhi. “I saw her taking care of babies who people had thrown in the garbage, and I fell in love with her. We have been together ever since we married in 1965.Ye mujhay chorti nahin hai, aur main isay chorta nahin.” (She doesn’t leave me, I don’t leave her either.) The couple has four children together, two sons and two daughters. In the late 1990s when the Edhi Foundation introduced a cradle outside many of its offices so that parents who did not want their babies could leave them at their centres instead of killing them or throwing them in garbage, the foundation faced backlash from the clerics. “Parents feel that their sons will earn for them in old age, and their daughters will be an economic burden. Aren’t they stupid? No one can match a daughter’s love for her parents,” he says. A case in point is when a robbery took place at the Mithadar office in 2014. Bahria Town tycoon, Malik Riaz, offered the Edhi Foundation a cheque worth Rs50 million. Edhi returned it. 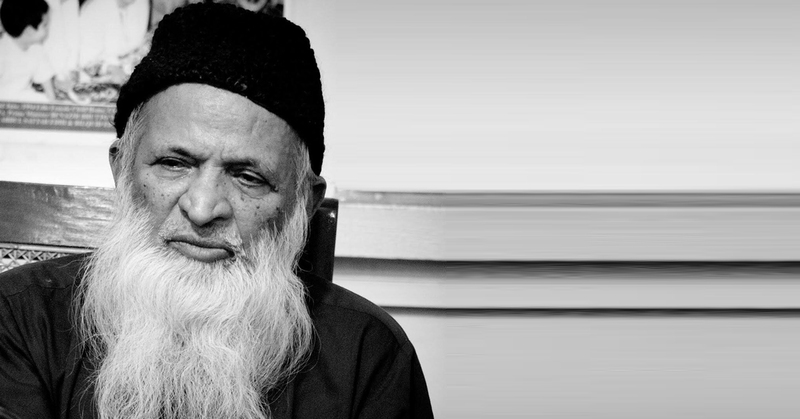 “We do not need funds from people who corrupt the system,” says Edhi. But the robbery hurt Edhi, for he felt he had helped police and robbers alike. To remember the date, he has marked it on the iron cupboard where he stores the funds — 19/10/2014. The Edhi Foundation is a journey of a sole man — an outcast and a rebel — who wants to live his life helping mankind. He was ridiculed, scorned at but he stood his ground and established an empire which would serve humanity for years to come. “We have no shortage of funds. Faisal, are we short on funds?” Edhi asks. — This interview was originally published in The News in January, 2016.